“He saved my life”: 19 reasons to get a service dog for your anxiety – ComeHereBoy! Anxiety had taken my life from me. My brain no longer seemed to do what I wanted it to, despite force of will and healthy habits. I was left sobbing on my bed feeling alone (despite having my husband wrapped around me) some nights or having to sit in the foyer of the church because I suddenly felt like going into a class was overwhelming for me. I already had been recently diagnosed with bipolar disorder and anxiety now seemed to be the cherry on top. Would I ever be me again? I saw a psychiatrist. Medication he prescribed helped some, but it never got rid of my problems entirely. No – the real cure for me was a stray German Shepherd named Bronco. Bronco has saved my life and given it back to me. Those of us who own dogs know that their unconditional love and intuition is innately healing. When you have a mental illness that significantly affects your life each day, a dog can be a literal lifesaver. Your dog can actually be prescribed to be by your side by a psychiatrist – a side-effect free “drug” known as an emotional support dog (ESD) or a service dog (SD). You may know some things about a service dog. A professionally raised and trained service dog is extremely expensive and it can take years on a waiting list to get one. What many people don’t know and what I’ve made it my goal to teach them, is that a service dog does not need a special certificate or breeding. You can have your own service dog, specially prescribed by your doctor and trained by you to help you function in public. Dogs have incredibly acute senses, more so than we give them credit for. Your dog notices when you begin to breathe more quickly or heavily. He notices when you begin biting your nails or pacing. He can even detect a change in your scent or heart rate as you begin to feel stressed. So before you even start to realize that you’re becoming panicked, a service dog that has been trained well will let you know it’s time for an intervention. A service dog will not hesitate to bother you until you take action when a panic attack is on the horizon. Well-trained service dogs will nudge you, whine or bark or stop moving until you let them help you, so you’d better listen and not wait until it’s more convenient (which could mean it’s too late). A friend might be worried about making you sit down in the middle of an aisle in a grocery store and giving you a hug, but your service dog will always prioritize your well-being over anything else. Your service dog will bother you until you take care of yourself, and this will keep panic attacks from getting too bad to handle. Dogs, even non-service dogs, provide a calming effect just by being nearby. Having a service dog by your side drops your heart rate and blood pressure. Even people with agoraphobia often find that a dog helps them get out much further than they have before – just because of the relaxing presence that a dog has. One nice thing about being out in public with a service dog is that you don’t have to worry that people are focusing on you. All that they are interested in is your dog. So all eyes are on the dog and you don’t have to feel as worried about people staring at you. This one may seem like a drawback, but realize that the people will be focused on your dog instead of you. When you are talking about your dog (an easy subject) and people aren’t usually looking at you, it’s a good way to ease into social interaction. Your service dog makes a great go-between. If you’re anything like me, the alarm for your medication goes off several times a day. You turn off the alarm, get distracted, and the next thing you know your anxiety is rising and you realized you forgot to take your medication. Service dogs are great, because they can be an alarm that won’t leave you alone. A well-trained service dog knows when it’s time for your medication and they will bother you until you take it. Deep pressure therapy is scientifically proven to be very relaxing and calming, especially during a panic attack. This therapy has been shown to shorten and lessen the severity of panic attacks. If you have a service dog, he can lay his head or body against your chest to give you deep pressure therapy at any time of the day. It’s a medication-free way to help if your dog notices an attack coming on. During an anxiety attack, you begin to lose sense of the here and now – which is part of the panic that grips you. Part of a service dog’s training can be to lick your face or hand or poke at you to help you keep a hold of your senses during an attack. You might also find that petting your service dog helps ground you as well. If your dog gives you deep pressure therapy by pressing up against your chest in your lap, and is licking your face while you pet them, you’ll find that you can keep from losing yourself in the panic much more easily. This is one of the more impressive tasks a service dog can do. Service dogs can be trained to find the exit from a store or building for you. This is absolutely fantastic if you begin to feel claustrophobic or overwhelmed and need to get outside or away from people as quickly as possible. It’s most useful, of course, if you lose your sense of direction. Your service dog can get you out in no time. They can also find your car, which is useful even if you aren’t having a panic attack. If a panic attack comes on while you’re upstairs and your friend/roommate/family member/significant other is in the basement, how can you let them know something is wrong in time? The answer is that your dog can find them and let them know. A service dog can be trained to find people by name, so they can fetch a person to help if you need it. Another task a service dog can provide is to bring your phone to you. This can do two things: help you feel comfortable knowing your dog can find and bring your phone if it’s lost, or get your phone if you need to call someone to help you. If you struggle with health anxiety (what if I break my leg and can’t get to my phone?) like I sometimes do, it feels good to know that your dog is there to help if you can’t find or get to your phone. Sometimes during panic attacks, well-meaning people try to come help you. Many times, however, strangers can make a panic attack worse. A service dog can act as a barrier between you and strangers, pacing around you and pushing people away while you calm down. So many people with crippling anxiety have found relief through service dogs. They go from having to rely on and inconvenience a family member to being able to live, go to school, travel and work with a dog by their side. A service dog can be literally freeing. If you suffer from depression along with your anxiety, dogs have been scientifically proven to treat depression. People have a higher quality of life and are happier when they own a service dog because they know they have someone to take care of them. Everyone is happier when they can take care of themselves. Cortisol is a hormone that indicates our stress levels and is related to anxiety. In this study, autistic children’s cortisol levels were measured before having a service dog, while they had a service dog, and after the service dog left their home. There was a statistically significant reduction in cortisol levels while they had the service dog in their home compared to before and after. This has been shown to also be true for heart failure patients and children with insecure attachment difficulties. Having a well trained service dog can help you feel safe in more ways than one. Of course, there is the safety that comes from having a backup for managing your anxiety – a second set of paws devoted to watching you for symptoms. There’s also the physical safety that a dog can bring as well. A good sized dog will make a person with any scary intentions think twice before doing anything to you – whether or not your dog would actually protect you. Studies show that people feel less lonely when they have a service dog. So if you need to move somewhere where you’re by yourself, you don’t need to feel like you’re alone. You’ll always have a friend in your service dog, and you’ll never find a better one. He’ll always be there for you. Service dogs are allowed by law in any apartment or home, so you don’t even need to worry about finding pet-friendly housing. If there’s anything that makes you want to stay home all the time, it’s anxiety. Nothing is more embarrassing than meltdowns around other people. The unfortunate thing is, if you don’t go out, things just get worse. Studies show that the positive interactions with people and the reduction of stress that a service dog brings will have you going out more. You’ll actually want to leave home. You’ll feel less worried about what is going to happen and more confident that things will go well. If you feel like anxiety has taken your life away from you, a service dog can give you back what you’ve lost. My dog’s incredible sensitivity to my needs helps me function from day to day like I used to. My dog has in many ways saved my life, and many other people with service dogs feel the same way. 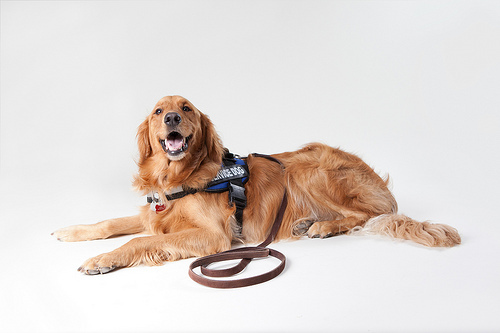 Almost any dog can be a service dog with the right training on your part. You can find healing and hope with your best friend by your side. Bronco has been one of the best things that could have ever happened to me – I couldn’t imagine living without him now. Dogs are a wonderful addition to an anxiety treatment plan. To learn more about training a dog to help with anxiety, please drop by my website: https://comehereboy.com/ and take a moment to sign up for my newsletter. Next PostNext Will My Dog Be a Good Therapy Dog?